In the fortnight after the Austrian GP, Niki Lauda came off the critical list and returned home to Salzburg where he began to prepare for a comeback at Monza. Lauda's amazing recovery (and the fact that the Austrian was still 23 points ahead of James Hunt in the World Championship) convinced Enzo Ferrari to send a car to Holland for Clay Regazzoni to drive. McLaren had a new M26 but Hunt decided to stay with the M23 leaving Jochen Mass to develop the new car. Shadow also had a new DN8 for Tom Pryce. Brett Lunger had stepped down from the Surtees and Sweden's Conny Andersson had been drafted in for the weekend, while Jacky Ickx had been signed up by Ensign. Guy Edwards was out of action having aggravated an old wrist injury at the Nurburgring and his place was taken in the Hesketh team by Rolf Stommelen. Also in action was the Boro team which had Larry Perkins driving the much-modified old Ensign while local racer Boy Hayje was at the wheel of a Hexagon of Highgate Penske PC3. The RAM team ran into more legal trouble, this time from sponsor Tissot, and so Loris Kessel and Lella Lombardi did not get to run. Qualifying resulted in pole position for Ronnie Peterson's March with Hunt second in his McLaren, Tom Pryce third in the new Shadow and John Watson (the winner in Austria) fourth in his Penske. Then came Regazzoni, Mario Andretti (Lotus), Vittorio Brambilla (March), Jody Scheckter (Tyrrell), Carlos Pace (Brabham-Alfa Romeo) and Jacques Laffite (Ligier). Ickx was 11th in the Ensign while Perkins ddi a good job to put the Boro 19th in a field of 26. In the race Peterson took the lead at the start and Watson forced Hunt back to third. Andretti was fourth with Pryce behind him. Peterson discovered that his car was not handling well and Watson was able to close up on him. Watson tried to pass several times and on the second he went wide and Hunt was able to slip through into second place. On the following lap Peterson dropped behind Watson and on the 18th lap behind Regazzoni, who had battled his way ahead of Pryce and Andretti. The order then remained unchanged until lap 48 when Watson's race ended with a gearbox failure. 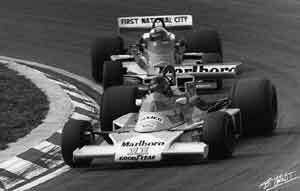 Hunt was alone at the front and while Regazzoni was able to close up he could not overtake and Hunt won by a second. Peterson's third place disappeared on lap 53 when he lost oil pressure and so Andretti finished third with Pryce fourth, Scheckter fifth and Brambilla sixth after Ickx went out with an electric problem with just a handful of laps to go.